Both Wise Agent and Top Producer are real estate-specific customer relationship management (CRM) platforms that help agents organize leads and transactions. Wise Agent costs $25 – $29/month while Top Producer costs $40/month. Choose Wise Agent if you already have an IDX-enabled website in place and Top Producer if you want a comprehensive lead management platform. Wise Agent is the superior CRM if you and your agents are already using real estate-specific lead generation tools like IDX websites and third-party email marketing software to boost business. In addition to being less expensive than Top Producer, Wise Agent’s robust integrations make the CRM an excellent way to organize and nurture existing leads. In addition to client management and nurturing tools, Top Producer features built-in IDX capabilities you can add to your CRM for an additional fee. Because of this comprehensive functionality, Top Producer lets you streamline all your real estate tools. Try Top Producer if there’s room in your budget for a more comprehensive and all-in-one real estate CRM. If Wise Agent and Top Producer don’t fit within your budget and you don’t need real estate specific integrations, consider Freshsales. Freshsales is a general-use CRM and our top choice for small business CRM because of its customization options and easy-to-navigate user interface. Plus, Freshsales ranges from just $12 to $79 per user, per month and offers a Free Forever Starter plan including unlimited users, contacts and support. When comparing Wise Agent vs. Top Producer, we evaluated each platform’s tools for organizing client details, nurturing lead relationships and tracking transactions. We also considered pricing, CRM functionality, lead nurturing and app integrations. Ultimately, we identified Wise Agent as the most robust real estate CRM for your real estate business for the greatest value. Based on our analysis of Top Producer vs. Wise Agent, we chose Wise Agent as the top choice for a real estate CRM. In addition to offering comprehensive features and streamlined integrations, Wise Agent offers affordable options for small teams. The ideal CRM offers comprehensive, user-friendly features and robust integrations. We compared the pricing structure and features of Top Producer vs. Wise Agent to determine which platform offers agents the best value. Even without a built-in IDX website, Wise Agent offers the greatest value among the options we considered. Wise Agent costs $29 per month for five users or $299 ($25 per month) when billed annually; you can add more users for a fee. For that reason, Wise Agent is less expensive than Top Producer, especially for agents who are using the platform for small teams of five users or fewer. Wise Agent offers a wide range of CRM services, including lead generation, dialer integrations and marketing tools. Users have access to the same features regardless of their team size. However, agencies already using third-party lead generation and marketing tools benefit most from the CRM because it requires a shorter learning curve and less setup and training. Wise Agent is a CRM platform that integrates easily with lead generation tools like Zillow, BoldLeads and Real Geeks, However, unlike Top Producer, lacks a built-in IDX website. Plus, Wise Agent helps you build prospects by syncing with your Google contacts through manual entry and using lead capture forms. The platform also lets you create landing pages with its Lead Capture Form Wizard that can be entered directly into the backend of your website. The Wise Agent CRM includes basic, user-friendly contact management tools. The platform makes it easy for you to track your prospects and agents with an easy-to-access and intuitive call list format, communication tracking tools and a referral tree tool — similar to the referral tracker available through Top Producer. Wise Agent also features a mobile web app similar to the Google Chrome app available for Top Producer. Wise Agent helps agents customize buyer profiles and listing templates to build transaction checklists for tracking closing dates, contact information and agent notes. What’s more, you get unlimited document storage and integration with DocuSign so that you can create and organize transaction documents without using a third-party syncing app as required for Top Producer. Plus, you can manage your most important transactions using the property list and Transaction Hot List. Screenshot of Wise Agent checklist tool. Like Top Producer, Wise Agent integrates with dialers rather than having a built-in telephone follow-up tool. However, Wise Agent offers agents greater dialer options by integrating with Mojo Dialer, PhoneBurner and FaceTime to offer automatic calling, voicemail and short message service (SMS) texting. In contrast, Top Producer is only integrated with Mojo Dialer and PowerDialer. Like Top Producer, Wise Agent includes a variety of marketing tools to help agents create and customize flyers, newsletters and letters. Agents can also use Wise Agent to send email marketing campaigns using extensive integrations with major platforms like Mailchimp and Constant Contact. In addition, Wise Agent features a slideshow tool for creating listing presentations from existing property information. Screenshot of Wise Agent marketing tools. Wise Agent allows agents to track leads quickly and easily by monitoring monthly emails, tasks, events and more from the user dashboard. To make the reporting feature even more accessible, you can view up-to-date prospect statistics from any page using a floating window. Top Producer offers similar features including a variety of comprehensive report options. Screenshot of Wise Agent Reports feature. In addition to syncing contacts with Gmail, Wise Agent features complete integration with the Google Suite. The platform also includes features like a Twitter feed reader and RSS feed integration that updates your dashboard with relevant real estate news, a feature more extensive than Top Producer’s ability to link with your contacts’ Twitter feeds. What’s more, Wise Agent integrates with a variety of other third-party apps including BombBomb, dotloop and several CRMs. The Top Producer platform includes a variety of à la carte services that let agents customize the software. Top Producer’s CRM is $40 per month, and users can select additional services like an IDX website or the Market Snapshot tool for $35 per month and $60 per month, respectively. Additional websites are available for $25 per month. Top Producer includes a CRM dashboard, email marketing tools and an optional IDX website feature to help agents organize leads and maintain a consistent follow-up schedule. 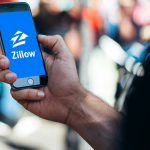 For an additional fee, the platform also includes the Top Producer Market Snapshot tool, which lets users share relevant neighborhood market data with their leads. Top Producer offers real estate websites with fully integrated IDX capabilities as part of a $35 per month add-on feature. You can also use Top Producer’s Market Snapshot tool for $60 per month to provide your clients just sold, just listed and price reduction activity within your market. This way, you don’t have to integrate with a third-party IDX-enabled website like with Wise Agent. Similar to Wise Agent’s reporting dashboard, Top Producer’s greatest strength is its CRM dashboard that offers real-time lead tracking and the ability to see how long leads have been active. The CRM tools also enable agents to choose hot leads, receive notifications when it’s time to follow up with stale leads and track thousands of client touch points annually. Agents can use Top Producer to track the lifecycle of a lead by taking advantage of the contact status tool. This tool lets agents categorize their leads as new, engage, future, active, closed, inactive or nonclient. 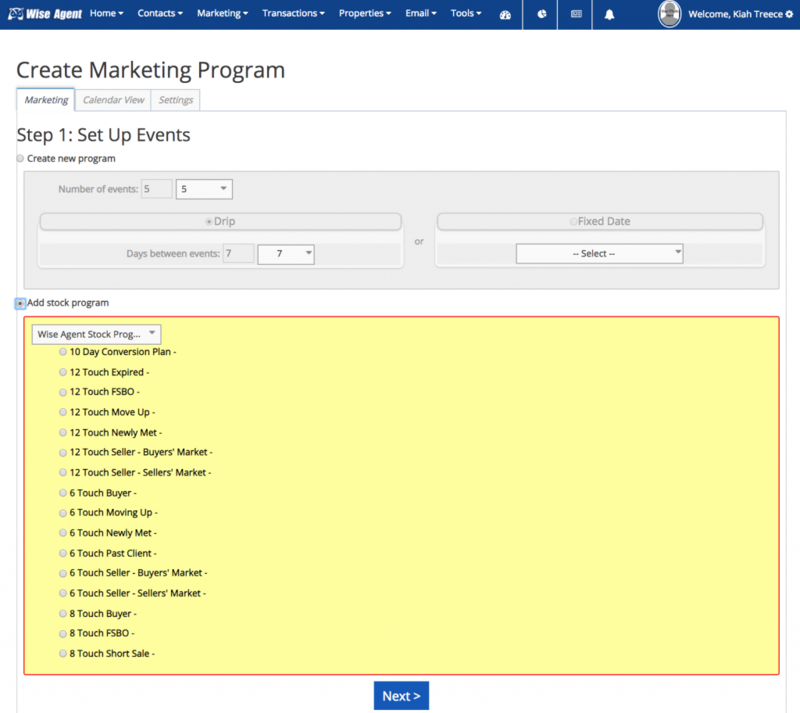 As with Wise Agent, you can customize lead tracking by assigning categories at one of several times, including when you contact a lead for the first time, when you qualify a lead and when you’re actively working with a lead. The platform doesn’t feature as many dialer integrations as Wise Agent, but Top Producer does let agents integrate the CRM with Mojo Dialer and PowerDialer. However, Mojo Dialer is an extremely robust dialer, so agents won’t feel like they’re losing functionality. In addition, Power Dialer enables agents to import and export leads to and from Top Producer easily. Top Producer includes tools to help agents create marketing campaigns including lead-specific emails from templates, automated campaigns and newsletters with relevant market information. Like Wise Agent, Top Producer also integrates with top marketing tools like BombBomb and Mailchimp. Top Producer also lets you create a custom real estate app using snapp so that you can market to potential clients on the go. The Top Producer reporting feature provides agents with several reports to help track leads and correspondence. In addition to the summary report, which lets agents see all of their lead information in one place, you can monitor usage and view agent reports to evaluate how often and effectively your team is using the CRM. Finally, use the follow-up report to track how many leads your agents have followed up with and how long it typically takes them to do so. Screenshot of Top Producer follow-up report. Top Producer integrates with a variety of third-party apps that let agents connect the CRM to marketing initiatives, lead follow-up tools, content development, video creation tools and other lead nurturing tools. Useful integrations include BombBomb, Mojo Dialer and more. You can also connect with Mailchimp to create custom drip marketing campaigns that follow up with the hottest leads at the most optimal times. Both the Wise Agent and Top Producer CRMs feature lead management tools, email marketing and dialer integrations and transaction tracking. However, user reviews reveal that Wise Agent’s interface is somewhat clunky while Top Producer’s is slightly outdated. Even so, Wise Agent has excellent reviews for ease of use, making it our top choice in that category. 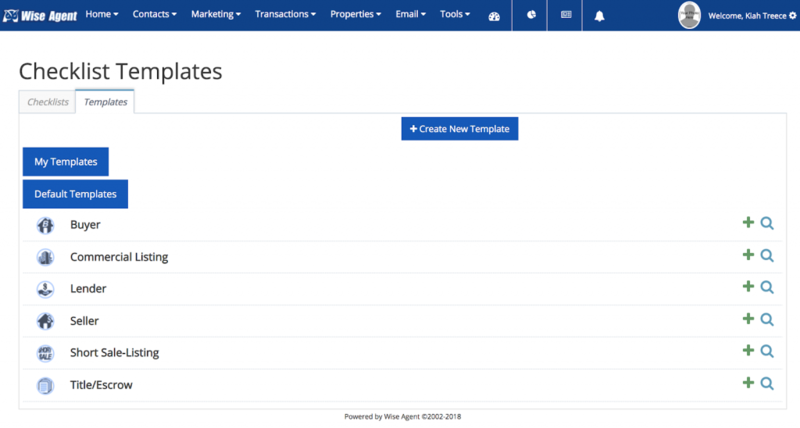 Agents who use the Wise Agent platform consider it to be a user-friendly tool for managing contacts, tracking transactions and creating marketing campaigns. Some users have reported that the agent dashboard is clunky, but reviewers generally report that the platform is intuitive and easy to navigate. Overall, the platform’s user-friendly tools have garnered it high marks for ease of use. Some Top Producer users report that, in spite of Top Producer’s substantial online resources, the platform is difficult for nontech savvy people to use. What’s more, some agents feel that the platform’s user experience is outdated and that the Top Producer mobile app is difficult to use. However, many agents report that Top Producer’s customer service and online tutorials make up for these issues. Wise Agent and Top Producer both offer email, telephone and online web support. In addition, both platforms provide users with extensive tutorials to help them learn and optimize CRM tools. However, Wise Agent’s customer service has better reviews online, so we identified it as the preferred choice. Wise Agent provides its users 24/7 support and a variety of online resources, including the Wise Agent CRM blog and recorded classes. Upon signing up for a free trial, we found the team to be extremely accessible and responsive. Overall, Wise Agent stands out because of the 24/7 support and wide variety of up-to-date video tutorials. Screenshot of Wise Agent video tutorials. Top Producer offers customer support via phone, email and online request forms. 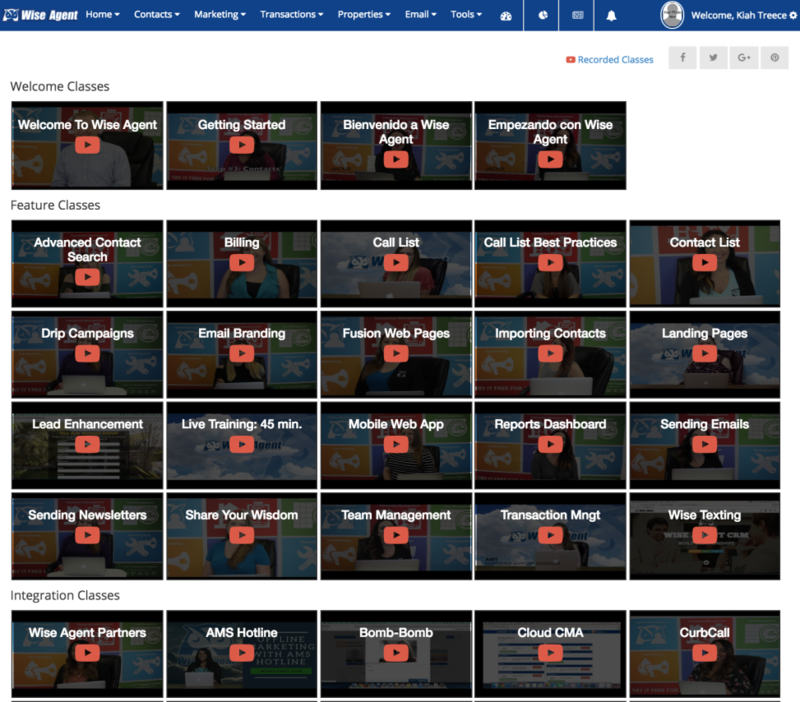 Agents can also take advantage of Top Producer Campus, which provides users video tutorials, free live online classes, trainers and self-directed learning courses. 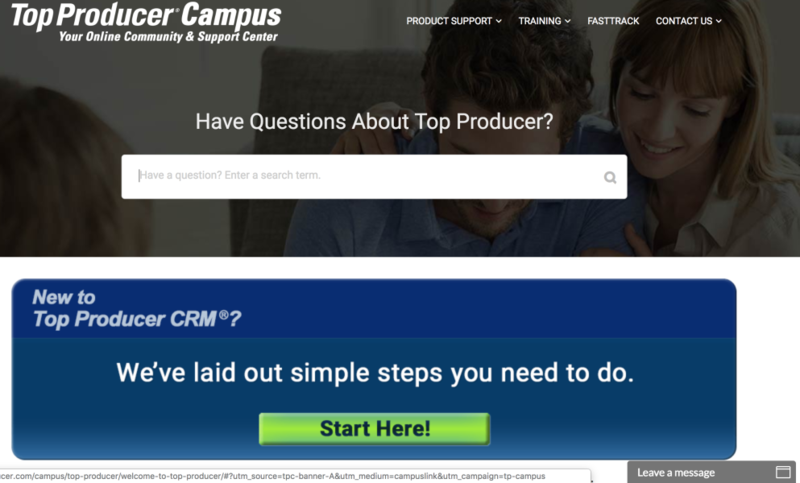 Screenshot of Top Producer Campus. Wise Agent and Top Producer both have excellent reviews from users. In general, both providers offer robust CRM dashboards, transaction tracking tools, integrations and marketing features. However, because of variations in pricing, features and ease of use, reviews are generally much higher for Wise Agent. Wise Agent has excellent ratings for ease of use, customer service, pricing and overall experience. Specifically, users find the platform’s dashboard to be intuitive and user-friendly. In spite of Wise Agent’s easy-to-use tools, some agents found the platform’s email marketing and newsletter templates outdated. Check out our Wise Agent reviews page for additional details about what actual users think about the software. Overall, Top Producer has a lower customer rating than Wise Agent. Top Producer customers report that they like that the software integrates with so many third-party apps, but some agents find the platform to be outdated. Because of this, the software has been described as difficult to use. For more information on what users think about Top Producer, check out our Top Producer reviews page. What Is a CRM for Realtors? A CRM for Realtors is a customer relationship management tool that helps agents organize and nurture their real estate leads. Generally, a CRM for Realtors includes tools like follow-up tracking, email marketing campaigns and transaction tracking. Depending on the CRM, the software may also include IDX-enabled websites, a built-in dialer and more advanced tools. What Is the Best CRM for Realtors? The best CRM for Realtors depends on your real estate team and budget. This also depends on whether you want built-in tools like an IDX-enabled website or dialer or a variety of third-party integrations. When choosing a CRM, also consider the types of marketing tools you need like BombBomb for video or Mailchimp for email marketing campaigns. When Should You Consider an Alternative CRM? CRMs like Wise Agent and Top Producer offer real estate agents tools to manage and nurture leads. However, other less-expensive options are available if you don’t need real estate agent-specific tools. For example, Freshsales offers a variety of pricing options, including a Free Forever Starter plan and paid options ranging from $12 per user, per month to $79 per user, per month. Wise Agent offers the best real estate CRM platform we considered. Try Wise Agent if you want a user-friendly CRM plus lead generation integrations, marketing tools and transaction management at a great value. The platform is less expensive than Top Producer and is ideal for agents already using lead generation and marketing strategies to grow business. However, if you’re still looking for a less-expensive option and don’t need real estate agent-specific tools, try Freshsales. Freshsales offers a variety of pricing options, including a Free Forever Starter plan that boasts unlimited users, contacts and support. Paid options start at $12 per user, per month and increase to $79 per user, per month. Check out its website for more information and to schedule a demonstration. FREE Professional Real Estate CRM!